The BBC has pledged to send the kids scurrying back behind the sofa during the new series of Doctor Who, despite being inundated with calls last year from parents worried their children were being traumatised. The corporation is planning a marketing blitz as it seeks to create a buzz around next month's launch of the second series of the family drama since it was successfully revived last year. Billie Piper, who returns as assistant Rose Tyler to David Tennant's Doctor, revealed that an upcoming storyline dealing with satanism, set in an spaceship adrift on the edge of a black hole, was "very dark". James Strong, who directs the episodes, said: "It's as scary as we ever get, really." Tennant's first outing as the Doctor, in a Christmas Day special watched by more than 10 million viewers, had a strong anti-war theme and the executive producer, Russell T Davies, whose previous series include Queer as Folk and Bob and Rose, said he would not shy away from grappling with big issues in the new series. The opening episode, New Earth, will featuring a private hospital run by cats who rely on an enormous lab of disease-ridden humans to research new cures. The series will also see the return of K9, the robot dog that accompanied Tom Baker's Doctor, and Elisabeth Sladen, who previously played assistant Sarah Jane Smith alongside Jon Pertwee and Baker. It also features big-name guest stars including the comedian Peter Kay, a longtime fan of the show who wrote to Davies asking to appear. Davies said his dream booking would be "a big Hollywood star like Sigourney Weaver", and that he was open to the idea of a female Doctor. Tennant, who took over from Christopher Eccleston at the end of the last series, said: "The fact that everyone's so fascinated by it makes it the most wonderful job in the world but also the most terrifying." Quashing speculation to the contrary, Davies revealed that both Piper and Tennant had been signed up for a third series. But it is unlikely that Piper will appear in all the episodes. Doctor Who was earlier this week nominated for its first Bafta since 1977 and has become an unlikely plank in the BBC's plea for a rise in the licence fee. The corporation, charged with being "seriously entertaining" in a government white paper earlier this month, has pointed to the ambitious gamble of bringing back the show as evidence of the kind of risk-taking only possible with licence fee funding. Piper and Tennant claimed Doctor Who was part of a wider renaissance in British television drama. "There's some great telly about at the moment. There's some really clever and smart writers," Piper said. "British films are so hard to get made so you get some fantastic stuff on television instead," added Tennant. "People like Russell, Paul Abbott, Andrew Davies and Tony Marchant are writing some amazing stuff." The success of the series has also given rise to spinoffs, including the BBC3 show Torchwood, which will begin filming shortly. The corporation also announced plans to release so-called "Tardisodes" between each episode —60-second, self-contained back stories available on mobile phones. APA 6th ed. : Gibson, Owen (2006-03-30). Doctor Who returns, featuring K9 and Kay. The Guardian p. 7. MLA 7th ed. : Gibson, Owen. "Doctor Who returns, featuring K9 and Kay." The Guardian [add city] 2006-03-30, 7. Print. Turabian: Gibson, Owen. "Doctor Who returns, featuring K9 and Kay." 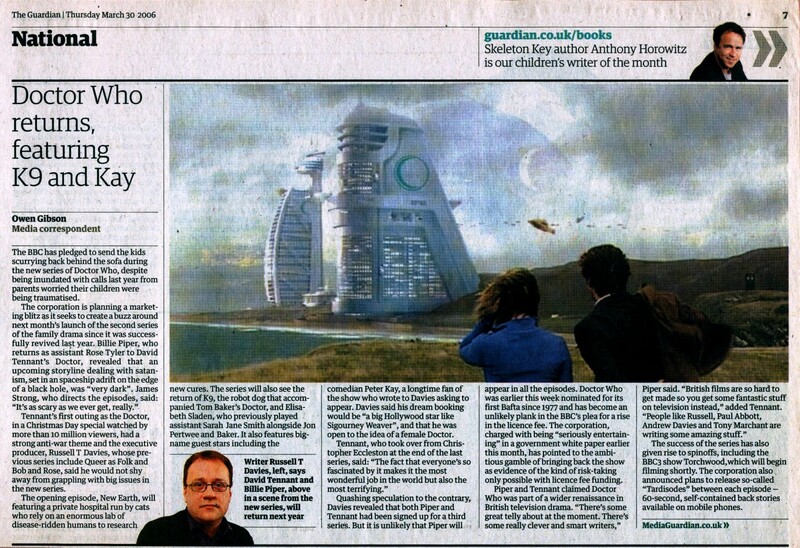 The Guardian, 2006-03-30, section, 7 edition.